A couple of Grizzly Bears fishing for salmon in Brooks Falls. 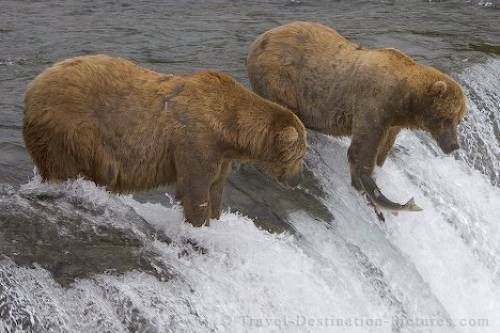 Every year in July the grizzly bears gather on brooks falls in Katmai NP to catch the spawning salmon in the Brooks falls. The spectacle attracts a lot of photographers and bear lovers from all around the world, so it's sometimes like an international photo equipment fair on the viewing platforms. Picture of two Grizzly Bears waiting patiently for Salmon at the Brooks Falls in Katmai National Park, Alaska.